I absolutely LOVE Swiss Chard, (although it's been determined that I pretty much love any vegetable) but nevertheless, I was excited to see beautiful bunches of Rainbow Chard this week at the Farmer's Market. I know I could grow these colorful little greens too, but frankly, I eat a LOT of chard and I'm happy enough to consume weekly supplies from our local farmers. 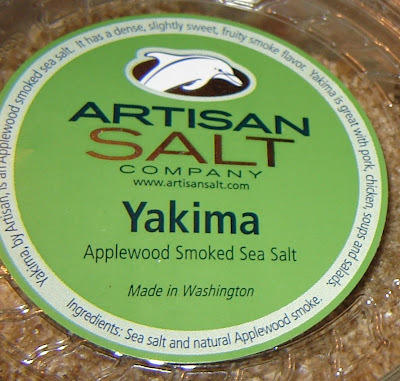 Now, I had also been waiting for a reason to use this incredible Artisan applewood-smoked salt that Froggy bought me last month. Doesn't it look fun? And if that's not enough, here's "recipe" number two. I worked so hard. 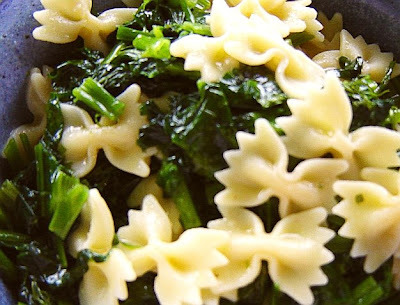 Butterfly Pasta with Sauteed Chard. Just toss some sauteed chard with cooked pasta and a handful of pine nuts or sliced almonds. Season with a pinch of salt and pepper. Couldn't be simpler and it tastes SOOO good! I'm so glad there's a whole lot more of this stuff around - AND that it's pretty dang good for me! Here is Jack the Pirate Cat - napping in the laundry basket with his chin propped on the phone. Me thinks he fell asleep talking to his girlfriend, or maybe he's dreaming of ordering take-out? Possibly he's just trying to avoid chores... Sounds too much like me, I know I certainly can't fold any laundry that might disturb a sleeping kitty. Happy weekend everyone. Get your chores done. i'm sure he's expecting an important call from the president! what a cute kitty! 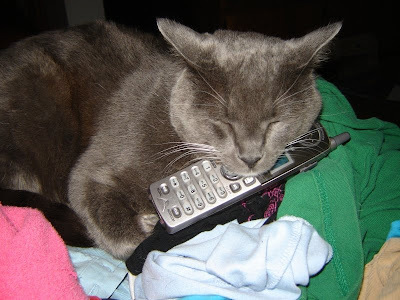 My cat looks very similar, but she hasn't learned to talk on the phone yet. 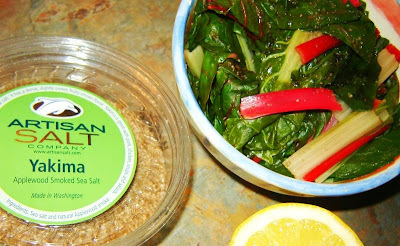 You're sooo lucky that you've been able to find decent swiss chard at the Farmer's Market - I haven't been able to find ANY :0( Love your recipes/meal ideas for serving up the chard! the recipes sound so great, i can't wait to try em!! I don't believe I've ever had chard...and I'm not sure why. I should put that on my list of new foods to try...I've been doing Chocolate Covered Vegan's new food challenge. I love chard too. My farmers market has a booth with about 20 varieties of salts, but they are awfully expensive. Have you tried yours yet? The cat is adorable, and looks just like my little Fernie. I have never had chard, I'll have to give it a try as I explore new vegetables. love the kitty pic! sooo cute!!! Mmmm you set up a chard craving. Having it for dinner tonight, but try as I might, I could not find smoked salt anywhere :( (just a nasty smokey bbq salt full of msg and flavour enhancers, blech!) so plain salt it is for us! Simple recipes are often the best ones. And I love your kitty! Jack is adorable! What a fun picture. I can't wait until chard starts showing up at our farmer's market. I would love to get my hands on some of that salt. What kind of cat is Jack? I have two Blue Russians that look just like him!